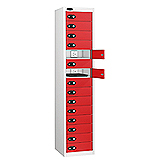 Available in a range of different colours and sizes, our stylish lockers are now available with charging points, meaning you can now store, lock and charge smart devices, laptops and small electronical items simultaneously. 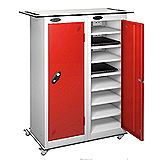 Complete with either shelves or compartments these charging lockers are an ideal addition to environments limited on space. 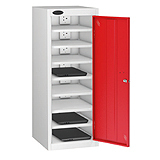 Serving both purposes of charging items and securing them a charging shelf locker also serves the same purpose as a charging station, meaning you can charge multiple items at once without the worry of loose cables or overheating. Hidden away with a steel door frame you are assured of reliable security. 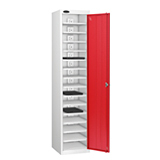 With an even greater choice of customization available, you can be sure to find a wide range of storage lockers for your needs. 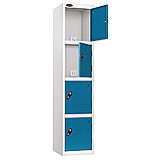 Manufactured in the UK with the a high quality construction finish, each charging locker is coated with an anti-bacterial coating and comes with a standard cam lock and key so no extra costs are involved! 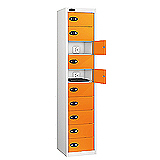 Customised sizes and finishes are also available, find out more by contacting our sales team on 01332 821200.